Homeowners are often advised by ‘tree trimmers’ to reduce the “windsail” of large conifers to prevent either whole tree failure or failure of large branches in the high winds. The term “crown thinning” has been used to define the process of selective thinning and removal of branches evenly spaced throughout a tree’s crown, or the action of reducing the length of long major branches. Usually, the amount and location of branch removal is not specified when this prescription is recommended. Although the trimmer may offer no explanation or detail, he or she may recommend is that the process be repeated, with frequency ranging from annually to every three to five years. The theory of the windsail pruning concept is that by removing some foliage mass, there is less branch resistance (sail effect) which allows wind to move more freely through the crown of a tree. Research findings to support this technique on mature conifers, such as we have in our region, are lacking. Formal research to determine the value of this practice on tree health has been done solely on “shade” trees, which are medium to large-sized deciduous trees that have different growth habits and biology. The practice has been controversial and much discussed among International Society of Arboriculture (ISA) Certified Arborists in the Puget Sound region. These arborists continually observe the biology and physics of conifers in our region. Based on these observations, arborists have found no clear evidence that windsail reduction is effective in preventing failure in an otherwise healthy, mature conifer with a decent form in fairly stable environments. Mature trees develop branches and foliage (needles) in order to produce the appropriate amount of food (through photosynthesis) to support themself. It does not make sense to produce more mass than what a tree can sustain. By removing live branches during a crown thinning process depletes a tree’s ability to make enough food for itself and stresses the tree. Mature trees have a more difficult time in positively responding to stress of any kind. The branches themselves provide a buffer to each other and in a sense protect each other from high winds. If a large branch is removed, its neighboring branches are now exposed and have a greater range of motion thereby increasing the probability of snapping in the wind. In general, it is not possible to pre-select which healthy branches to remove based on a higher probability to fail. 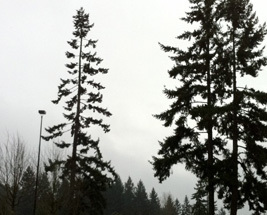 Douglas firs (Pseudotsuga menziesii) are one of our largest conifer species, and are known to drop healthy limbs during moderate to high winds. Shedding branches is thought to be the coping mechanism trees use in lieu of whole tree failure. Since it is virtually impossible to predict limb breakage, branch failure is a potential hazard when living with Douglas fir. While a large limb can incur significant damage if it fails, the damage rating when determining risk is low. Note that crown thinning is different than crown cleaning which is to remove dead and damaged branches only. Crown cleaning is often recommended, particularly if broken branches are hanging high in the canopy or large dead branches are located over valuable targets. Abrupt change in drainage within the critical root zone of the tree (which may impact root function) or significant root loss that was unavoidable (including trenching near the base of a tree). Homeowners facing these situations should discuss a course of action for their trees on a case-by-case basis with an ISA certified arborist. The resulting plan should take into consideration the long-term economic and environmental benefits of the trees, while considering the cost and time commitment necessary for retention. Practitioners continue to tackle the issue of helping trees resist strong winter storms. New methods, such as cutting back significantly long limbs in the tree canopy, are being used and evaluated for their effectiveness in protecting trees from failure. It is important to understand that this prescription cannot automatically be applied to every tree and should be discussed with a qualified professional. *adapted from an article written by Elizabeth Walker, MFR, ISA Certified Arborist, Sound Tree Solutions, Inc.